George Porter and Anna Porter of Lake Oswego Consulting Group will be the featured speakers at the Oregon Society of Artists today, August 9, 2012, from 11:00AM to 12:30PM. They will be providing an overview of their new Marketing Your Art Workshop Series developed to help artists, photographers and other creatives learn the essential sales and marketing skills necessary to promote their art and businesses. As fine artists and marketing and management specialists with 20+ years experience in helping businesses in Oregon improve their Sales, Marketing and IT Management functions and strengthen their bottom line, George and Anna understand the creative process and have turned their attention to developing programs specifically to help artists get their art and their art businesses moving along the “Path to Fame and Fortune”. This free initial overview presentation will be followed by three in-depth half-day workshops at the Oregon Society of Artists (dates to be announced), where Anna and George will go through the 5P’s of Marketing Your Art (Product, Price, Promotion, Place and People) in greater detail, with specific exercises and group activities designed to help artists create a Master Marketing Plan for their art businesses and learn how to leverage online marketing to promote their artwork. Follow this blog for more information on the upcoming workshops. 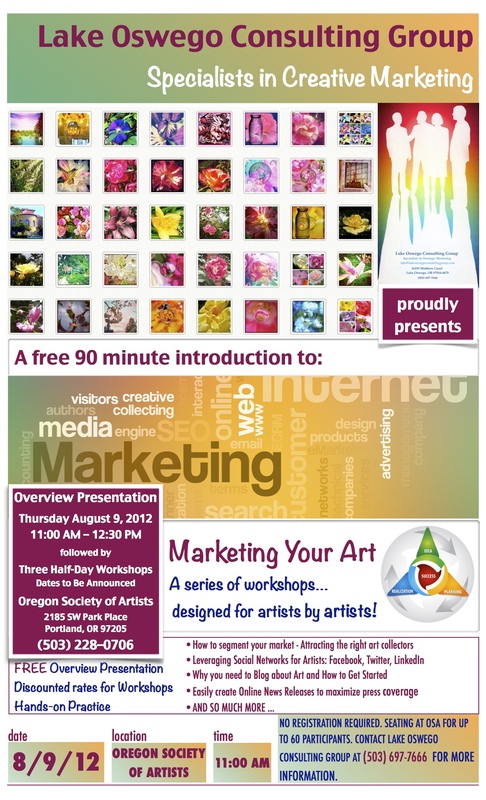 Attendees to today’s presentation at Oregon Society of Artists, who sign-up for the Marketing Your Art Workshop Series today, will receive a special promotional rate for each workshop and a bundled discount for all three. Call Lake Oswego Consulting Group at (503) 697-7666, or email Anna Porter or George Porter at info@lakeoswegoconsultinggroup.com with questions or to sign-up for the workshops. Oregon Society of Artists is located at 2185 SW Park Place, Portland, OR 97205. Today’s presentation is open to all Portland area artists, photographers and creative professionals. Doors open at 10:00AM and seating for up to 60 participants is available. Specialists in Strategic Marketing, Serving Business in Oregon since 1991. Mission To provide exceptional strategic marketing and management consulting services to businesses, government and industry in Oregon with commitment to excellence, determination to succeed, and outstanding customer service and support. Description Since 1991, Lake Oswego Consulting Group has been providing business, industry and government agencies in Oregon with exceptional strategic marketing and management consulting services. Founded by George Porter, Lake Oswego Consulting Group has worked with start-ups, SMBs, Fortune 500 companies, and federal and state government agencies, helping them put sales and marketing programs, business processes and systems in place to promote and sustain profitable growth. The senior consultants and partners, George Porter and Anna Porter bring a wealth of experience and creativity in: • Strategic marketing • New business development • Change management • Marketing communications • Print and internet advertising • Social networking • SEO content creation • Branding and content management • CRM systems implementation • Direct marketing • Sales Training and Management Call Lake Oswego Consulting Group at (503) 697-7666 today for an initial consultation and free estimate to jump start your business! This entry was posted in Art Blog, Art News, New Blog, News and tagged 5Ps, art, art blog, art business, art marketing, art pricing, art sales, artist, artists, business, business development, Facebook, Instagram, LinkedIn, Marketing, new business, Sales, social media marketing, SWOT analysis, Twitter. Bookmark the permalink.